Shipping weight = 34.00 lbs. From the Pistol Annie Collection. This barrel saddle features floral tooling accented with gator print, sparkly crossed pistol conchos, silver dots, bullet conchos and antique copper crossed pistol conchos. The Silver Royal Pistol Annie Saddle also features roughout fenders and jockeys and black suede seat with cutout gator print. Tough-1 quick change buckles. The crossed pistols complete the look. Swell on 13" saddle: 11 1/2"
Swell on 14", 15" 16" saddles: 13"
Horn on 13" & 14" saddles: 3"
Cantle on 13" & 14" saddles: 4 1/2"
Got this for my 13 yr old, she picked it out for her first new saddle. Super excited to say she loves it, says it rides comfortable and it looks amazing on her horse, plus light weight. We did have to add some holes to adjust the bridle and breast collar to her horse. Very well made and worth the price and the smile on her face. Pistol Annie on Ms. Dakota Twist. Nice "entry level" leather saddle for a young rider who wants to make a fashion statement in the arena or on the trail. The full quarter horse tree with generous gullet fits well across the withers of most horses without pinching or binding shoulder action. The sturdy leather hand-lacing that joins the skirts was an unexpected bonus. The buckles on the stirrup leathers are a unique design that are easy and quick to adjust. 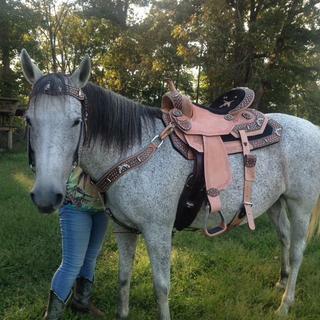 I am in love with this saddle still waiting on bridle and breast collar. Its on backorder. Bought this for my wife who really liked it. What is the bar length? This item comes with Full Quarter Horse bars. is this real leather or the look a like? BEST ANSWER: it looks and feels a lot like Mexican leather, it's not bad leather, at least on the saddle and breast collar, the bridle is debatable. It's pretty durable so far though! Is this a Barrel saddle ? are the stir up forward balanced? BEST ANSWER: Yes, and the saddle skirt has a cut-out which maximizes the swing of the fenders. Yes compared to my reining saddle they are. It's still a comfortable ride. what is the skirt length on the 16" seat size? BEST ANSWER: The skirt is 25" long. BEST ANSWER: Unfortunately I cannot guarantee a in stock date at this time. Is the seat size true to the measurements or do you need to go up a size? BEST ANSWER: Seat size is pretty much a true measurement, save for a little bit of padding in front of where the cantle is stitched. I purchased the 15-inch size for my 120 lb. god-daughter who says its fits her perfectly. They are true to measurement, but some rideers who are in between sizes sometimes go up to the next size, because of the higher cantle. Does this come with a girth? BEST ANSWER: Yes it did. This is a beautiful saddle, but it didn't fit any of our horses right. We were sad to have to return it. A girth / cinch would need to be purchased separately. It does however come with a latigo strap and an off billet. No, it does not come with a cinch. Does it come with the back cinch too? Yes. It comes with a front and back cinch. Are the flank billets and buck strap included? BEST ANSWER: The entire back-strap assembly is included and is very nice. All very thick leather with nice wide sleeves to tuck your back strap Latigo into. The pocket knife pouch on the back-strap latigo is also a nice feature. is this considered a child's saddle? BEST ANSWER: It is available in 13 inch 14 inch and 15 inch 16 inch. It is a barrel racing saddle. I bought it for my 14 year old she has been barrel racing since age 5. I bought her a 15 inch. BEST ANSWER: Yes, the gullet is 7" making the bars full quarter horse. Would this saddle fit a high withers? BEST ANSWER: This saddle has a 7" gullet and with the appropriate pad, should fit a variety of horses. However, it is always best to consult a local person with saddle fitting experience if you have questions regarding the fit of your particular horse. what is the skirt length? Is this a good entry level saddle for anow adult? BEST ANSWER: It is a beautiful saddle for sure, but it didn't fit any of our horses properly. Can you get this set in Semi Quarter Bars? Is it made in the USA? Where is this saddle and gear made, and by which saddle maker? BEST ANSWER: Tough-1, JT International. Can this also come with wither straps? Is this comfortable? Does this saddle come in black? BEST ANSWER: Wither straps are not part of this package. We do have them available separately in the Martin brand (item E008154). This package is available in the Light Oil color only.